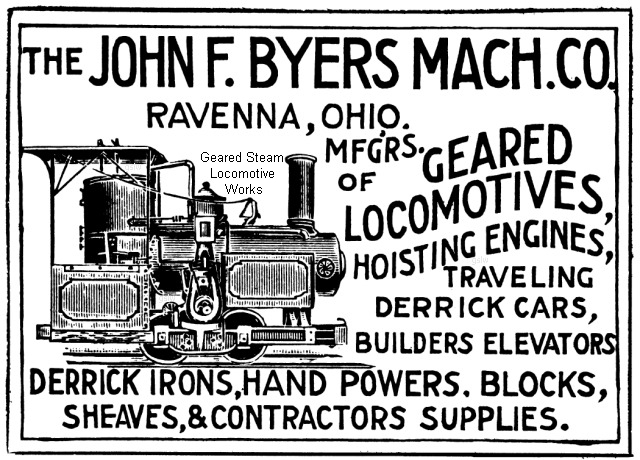 "A Geared Locomotive For Contractor's Use"
In 1873, John F. Byers opened the John F. Byers Machine Company in of Ravenna, Ohio. He began building various type of equipment for the construction industry. One of these endeavors led him to build a number of small geared steam locomotives. Relatively small in size, they were marketed as a light duty contractor type engine with gearing being promoted as an advantage over similar sized "rod locomotives". By May of 1896, four had been built with three of these known to be in use commercially. It is unknown when the company went out of business and how many locomotives were actually built. The last locomotive known to be built was completed in 1906. This places the minimum number built at 5 with the likelihood that more may have been built in intervening years between 1896 and 1906. Boiler "Tee" or "boot" type. Cylinders Two were vertically mounted on the frame. They were positioned on opposite sides of the frame, next to the boiler, approximately half the frame's length back from the front of the locomotive. Drivers Four drivers were mounted on the frame in fixed positions. Gauge Standard and 36" were offered. A detailed description with specifications is located in the article "A Geared Locomotive For Contractor's Use" with it's accompanying General Dimensions . Quantities: Total quantities actually built are unknown, but it is believed there were at least 5. When Manufactured: A comprehensive range of build dates is unknown, but from the information we have, May, 1886 to 1906 is a conservative representation. We are grateful to John Taubeneck of Seattle, Washington for his contribution of the article that became the inspiration for these pages.